​Phenology, sometimes referred to as “the pulse of the planet” or “the rhythm of the seasons”, is defined as “the study of recurring biological events”. Classic examples of phenology include leaf emergence, flowering, migration, and breeding. Phenological events are ubiquitous in nature, and as we cycle through the seasons, new phenological events are constantly occurring. With the PhenoCam network, we use digital camera images from over 400 cameras located at research sites across North America and around the world to track vegetation phenology in real time. Our new paper in Scientific Data presents a publicly-available data set derived from this imagery. The network started more or less by accident. 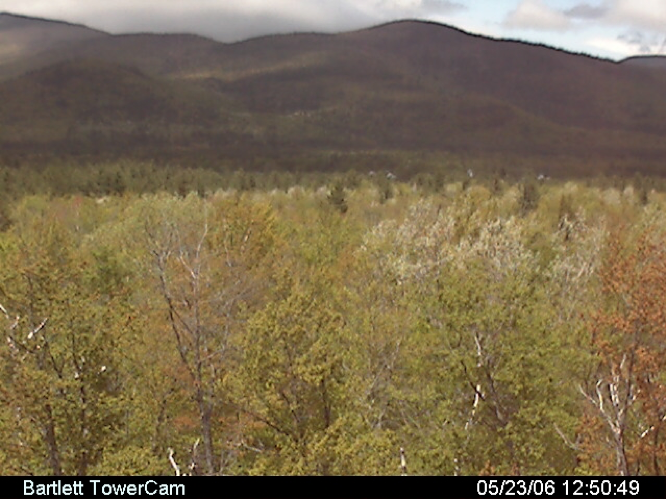 In 2005, with colleagues from the USDA Forest Service and the University of New Hampshire (UNH), I had put a camera on top of our research tower at Bartlett Experimental Forest. We had a primitive wireless connection (which often didn’t work very well, especially when it was rainy) between the tower and the Forest Service field station about 1.5 km away. At mid-day, images were sent from the camera to the field station and from there to a server on the UNH campus, about 100 km to the south. Our original idea was that we could use the camera images to watch as the seasons passed, and we could estimate key phenological dates — like when leaves emerged in spring and when they changed color in autumn – from visual inspection of the imagery. We also thought that the pictures we recorded would be useful for illustrating talks and posters. About 6 or 8 months after we had first installed the camera, I asked a graduate student with expertise in processing satellite imagery if he thought we could get quantitative data directly from the pictures. We were amazed when he showed that only a few simple lines of Matlab code were required to extract a “greenness” signal from the images. He named the Matlab script “phenocam.m” and the name stuck. 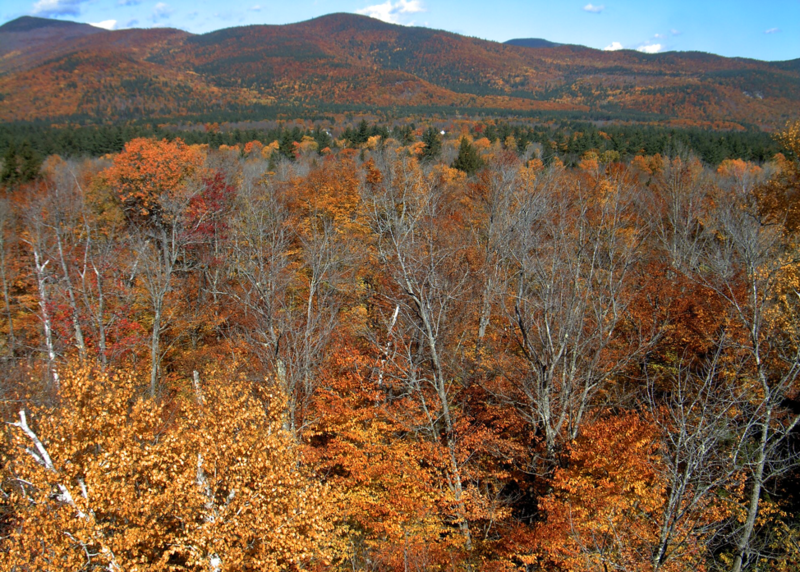 Within about a year, I had obtained funding to start a small, regional PhenoCam network focused on forests in the northeastern U.S. and adjacent Canada. Several years later, after quite a few rejected proposals, funding from the National Science Foundation enabled me to expand the network into a sparse, but continental-scale, phenological observatory. I used the grant money to purchase cameras, which we then sent to collaborators in the AmeriFlux network, who took care of camera installation and maintenance for us. In return, they were given full access to the imagery and derived data. Over time, our list of collaborators grew, and so did the network. We are now archiving about 4 TB of new imagery every year, and we add a handful (or two) of new sites to the network every month. Technology has improved, and a new camera, mounted on the Bartlett tower in 2016, captures beautiful high-resolution imagery that shows off the stunning autumn colors in this temperate deciduous forest. Assembling a processed, quality-controlled data set from the camera imagery proved to be more challenging than I ever imagined – I thought it would take about 6 months, but from our initial efforts to publication of our Data Descriptor took closer to 4 years. My collaborators and I are nevertheless thrilled to make 750 site-years of PhenoCam data available to the phenological research community. 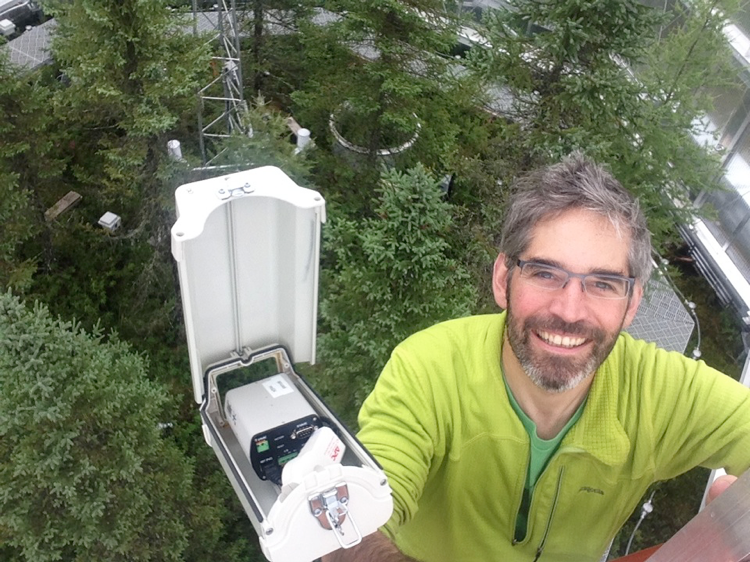 The author installing a PhenoCam at the SPRUCE experiment in Minnesota. What is involved in archiving life science datasets?